Coconut flour is a new and healthy alternative to the usual flours used in everyday products. The process of making coconut flour involves removing the milk from the meat of the coconut. 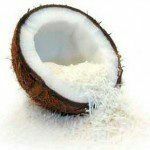 Coconut flower has a multitude of health benefits that can greatly improve one’s overall health due to the presence of the medium chain fatty acids that are found naturally in coconuts. Coconut flour contains 57% fiber which is much higher than the next leading competitor, wheat bran, which contains only 27% fiber (Jones). Fiber has a multitude of health benefits including reducing the absorption of sugars into the blood stream to lowering cholesterol (Fife). By reducing cholesterol levels, one’s risk of developing heart disease and diabetes greatly decreases. Because coconut flour contains a high amount of fiber, weigh loss can occur. This happens because fiber absorbs water which helps fill the stomach and satisfies hunger (Fife). Dietary fiber also helps to slow down the absorption of sugar into the blood stream which helps to prevent spikes in people with diabetes. The coconut flower also allows the body to regulate foods with a high glycemic index which gives diabetics more control over the foods they eat. Coconut flour has anti-cancer properties due to the presence of fiber. Fiber has a cleansing mechanism which helps to prevent toxins from building up in the walls of the intestinal tract. Fiber also absorbs fluids including carcinogens and other toxic substances and eliminates them from the body (Fife). Fife, Bruce. Coconut Flour: A Low-Carb, Gluten-Free Alternative to Wheat . pure zing, 2005. Web. 28 Jun 2012. Jones, Autumn. What are the Health Benefits of Coconut Flour?. natural Healhy Choices, n.d. Web. 28 Jun 2012. Weeks, Adrienne. “Side effects of Cocnuts.” . Livestrong, 04/04/2011. Web. 28 Jun 2012.